Happy Days Entertainment | Adult Party Packages that cater for everyone, what you need we provide! The best corporate entertainment and party entertainment in Newcastle and the North East! We offer a great selection of adult party and corporate entertainment to suit any need. 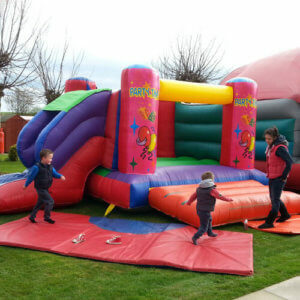 Choose from bouncy castles, party styles, large inflatable’s, party rides, DJ services, karaoke and loads more. We are based in Newcastle but provide entertainment to venues across the North East, North West and Yorkshire. Our corporate and adult themed entertainment packages allow you to add as many of our party entertainment additions as you want. Our team of experts will help you create the most stylish bash or red carpet event for your VIP’s that will be remembered for ever. Our large indoor and outdoor selection of party equipment will create a sensational environment for large corporate entertainment events. Business gatherings large or small are a great occasion to take advantage of some of our most adventurous party supplies and because most of our equipment is designed to withstand adult use, your complete corporate and party entertainment package will be perfect for hosting an inspiring blend of team building sessions and unique bonding experiences. We take care of the entertainment for you so you can enjoy being the host. Our staff are friendly and always happy to help you create a fantastic event. We cater for large corporate entertainment events and parties and our professional service and years of reputable experience in high quality entertainment means you can rely on our company to present your business associates and important guests with an outstanding balance of high class entertainment with a personal touch. Call Happy Days Entertainments Today!